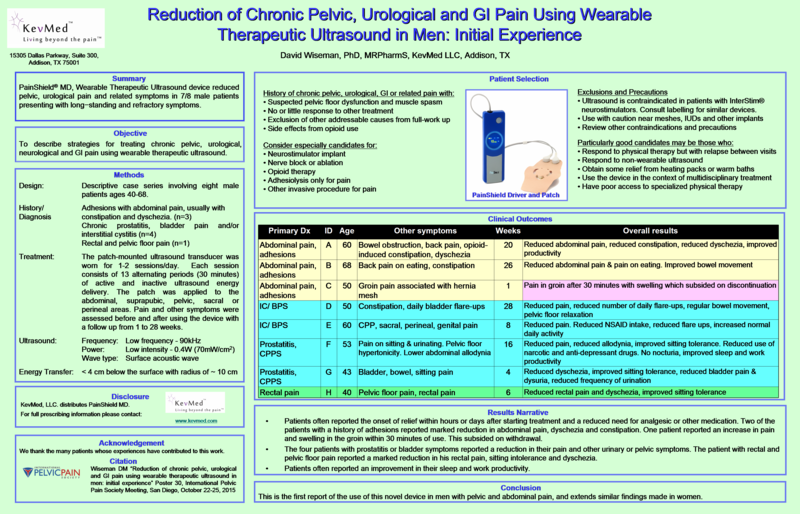 Objective: To assess the effects of Painshield MD (NanoVibronix Ltd., Nesher, Israel) - a wearable device delivering low−frequency, low intensity ultrasound in male patients with abdominal, pelvic and related pain. Methods: This is a case series involving eight male patients whose ages ranged from 40 to 68. Three patients had a hstory of adhesions with abdominal pain, usually with constipation and dyschezia. Four men reported diagnoses of chronic prostatitis, bladder pain and/or interstitial cystitis. One man reported rectal and pelvic floor pain. 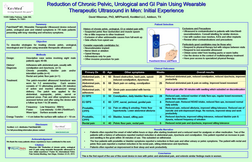 Patients were prescribed PainShield MD Wearable Therapeutic Ultrasound and applied the device to their abdominal, pelvic, sacral or perineal areas. Pain and other symptoms were assessed before and after using the device with a follow up from 1 week to 7 months. Results: Patients often reported the onset of relief within hours or days after starting treatment and a reduced need for analgesic or other medication. Two of the patients with a history of adhesions reported marked reduction in abdominal pain, dyschezia and constipation. One patient reported an increase in pain and swelling in the groin within 30 minutes of use. This subsided on withdrawal. Conclusion: This is the first report of the use of this novel device in men with pelvic and abdominal pain, and extends similar findings made in women. These preliminary findings will be used to design more comprehensive clinical evaluations. Summary: PainShield MD, a wearable ultrasound device was found to reduce pelvic, urological pain and related symptoms in 7/8 male patients presenting with long−standing and refractory symptoms.